Adarna, the well-known and much-loved Filipino folk tale, opens another year of exciting plays from Dulaang UP which is now on its 38th theater season. Adarna tells the story of Don Juan, the youngest of three princes who went on a journey to find the elusive mystical bird called Ibong Adarna believed to be the cure for their ailing father, the king of Berbanya. Don Juan’s quest whisks him to adventures in different lands, encounters with sage men and beautiful princesses and challenges that will test the young prince’s courage and mettle. Director José Estrella (Umaaraw, Umuulan Kinakasal ang Tikbalang) and her artistic team breathe new life into this dearly loved story of adventure, magic, courage, and love cherished by generations upon generations of Filipinos. This reimagining of this oft-told tale through a multimedia theatrical presentation blurs the distinctions between family dispute and love, home and faraway lands, and magical dreams and grim realities. Adarna is adapted for the stage by Vlad Gonzales; set and lights design by Lex Marcos; puppetry by Don Salubayba; costume design by Brenda Fajardo; music and musical direction by Jeff Hernandez; under the direction of José Estrella. 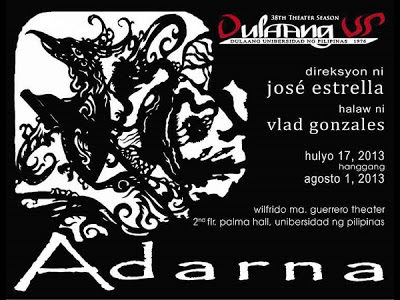 Adarna runs from July 17- August 1, 2013 (Wednesday to Friday, 7pm; Saturday and Sunday, 10 am and 3pm), and July 26 at 2pm, at the Wilfrido Ma. Guerrero Theater, Palma Hall, University of the Philippines Diliman. For sponsorship and ticket inquiries, please contact the Dulaang UP Office at 926-1349, 981-8500 local 2449 or 433-7840.